As we continue our #DisneyWorldCountdown, today we are at #Day28 and we are taking a look at the Flame Tree Barbecue quick service restaurant at Animal Kingdom Park. As I explained in my Updated Top 10 Quick Service Restaurants post, Flame Tree rose one spot from #8 in my old countdown to #7 in this year’s edition. It has a lot going for it — yummy delicious food, a nice outdoor seating arrangement that doesn’t feel too hot, even in the summer; and, despite how good the food is, it never seems to be that busy! So, in my opinion, it’s got the Disney Trifecta working for it! I love the ribs that I get there, and if memory serves me correctly, I also really enjoy the baked beans that you can get as a side dish with them! Yummy! My mouth is watering just thinking about it! If you are considering this restaurant for your next trip, here is a link to the menu that you can look at online! 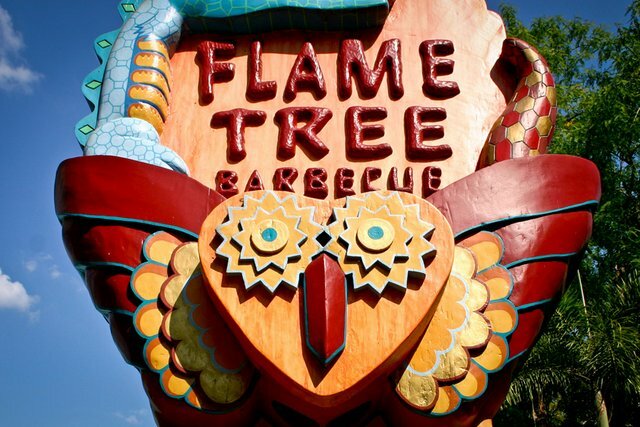 So tell me, is the Flame Tree Barbecue on your list of favorites, or is it on your list of not so favorites? Let me know in the comments below, and thank you for stopping by today as we bring to you our thoughts on Walt Disney World!